Relocating to a new country for a job or school? Looking to do business in a foreign market? Your prospective employer, educational institution or other authorities may have specifically asked you to get an Apostille. This happens when using important Canadian documents internationally like a Birth Certificate, Marriage Certificate, Degree, Police Check, Power of Attorney, Incorporation Certificate or Certificate of Origins to name a few. At Authentication Legalization Services Canada (ALSC), we encounter many people just like you searching for Apostille Information Canada. If your looking for a Canadian Apostille you come to the right place. However, it is essential to note that the Apostille process is only used by certain countries. Since 1961, a total of 112 nations have signed the Apostille Hague Convention, which established a shortened process for validating some documents for use in another country. The purpose of the Hague Convention is to abolish the requirement of legalization for foreign public documents. Canada has not signed the agreement, and therefore does not issue Apostille certificates. Now that you find out you cannot get a Canadian document Apostilled lets talk about how we can help you get the equivalent of an Apostille that will be accepted in any country. In Canada, the Apostille Certification process is referred to as Authentication and Legalization. If you have been asked to get an Apostille Stamp for your Canadian document, do not worry. Canada’s Authentication and Legalization process is the exact equivalent of the Apostille process, and is recognized by all countries who have signed the Hague Apostille Convention. The 2-step Apostille equivalent process involves first authenticating your document at Global Affairs Canada Authentication Services Section here in Ottawa. So what does that mean? Good question, Global Affairs Canada examines documents to make sure that the seal and signature of the official on your document is authentic. They also confirm the position of the official who has the authority to execute, issue, or certify your document so that it can be recognized in another foreign jurisdiction. To qualify Global Affairs Canada Authentication Requirements must be observed or it may result in delays or the document not being authenticated. Don’t worry about this, if you are using our service, we guarantee document authentication. One of our experts will review your document to make sure that it meets Global Affairs Canada authentication requirements. We understand like any government process it never seems fast enough, but we have a solution for this. To see how to save up to 20 business days from Global Affairs Canada Authentication Services Section current processing time, check out your options using our document authentication services. 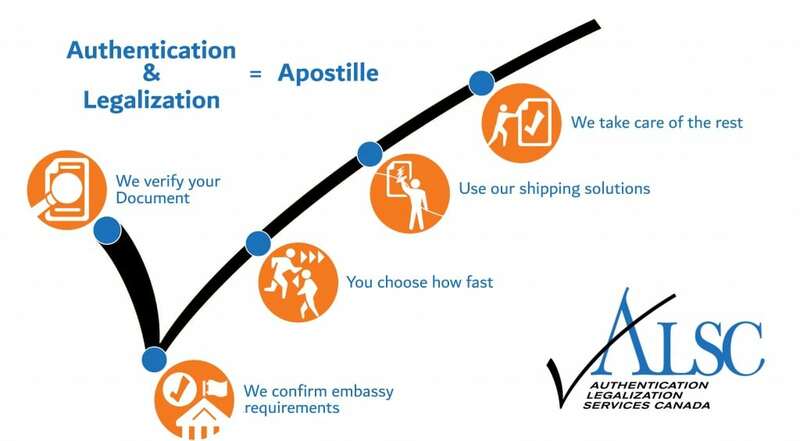 To complete the Apostille equivalent process document legalization takes place at the countries Embassy in Canada. Like Global Affairs Canada each country has specific requirements that must be followed. We keep up on the requirements, as they change often, to save any delays see more about our Document Legalization Services. Once we help satisfy all the requirements for Document Authentication at Global Affairs Canada and Legalization at the Embassy it will allow you to officially use your document in that foreign country. ALSC is here to ensure your document is properly authenticated and legalized in a manner equivalent to an Apostille. Our experts will help expedite the verification process, and can even send your document to the destination country in which it will be used. If you have any questions at all about the Authentication and Legalization process in Canada, or how it compares to an Apostille Seal Certificate, click the request a quote button below to speak with one of our friendly experts.